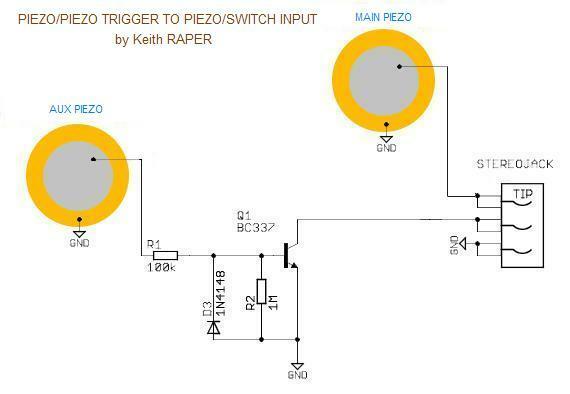 I have been getting a few PM's lately asking for help building Keith's piezo/piezo to piezo/switch circuit. So I figured I would do a quick little write up. 1. If you want to plug two mono pads into a piezo/switch input then you would use this diagram. This diagram can also be used in the same way #2 can be used. A little background on this circuit and how it works (bear in mind that I know almost nothing about electronics or electricity...). Essentially what this circuit does, is it takes the voltage from the switch piezo (i.e. edge piezo) and used that voltage to "flip" the transistor from open to closed. This will momentarily close the circuit which tells the module that you have hit the edge, bell, etc. The two circuits shown above differ just a little. The first one also uses the edge piezo to tell the module how hard you hit the pad (that is why the edge piezo is also connected to the tip and ground of the jack). The second diagram gets its velocity information (i.e how hard you hit the pad) from the head piezo (as you can see the switch piezo is not connected to the tip of the jack). Since the circuit can be used for many things (edge or cymbal, bell or cymbal, rim shot on tom, rim shot on snare) I am going to refer to this piezo simply as the switch piezo - because it is the one that closes and opens the transistor switch. So what exactly do all thos letters and numbers on the diagram mean? D3: 1N4148 Diode - a diode only allows electricity to flow in the direction of the arrow. Really there is no trick to putting the circuit together. You have to know which way to hook up your diode, which post on the transistor is which and that you only use two poles on the trimpot. That's about it. It's really easy to assembly the circuit by putting it on a project board (make sure you get one that doesn't have traces - unless you know what they are and how they work). Put all the components on the board roughly how they are laid out in the circuit. Don't worry about bending the wires on R2 or D3. You have to be a bit more careful with Q1 but you can bend the posts quite a bit before they break off. Once you have all the components layed out on the board get some thin single strand wire that is sheathed in plastic. Cut pieces of the wire to length in order to make all the connections for the circuit. Trim off the edges of the plastic sheathing so you have something to solder to. Now, run the wire on the same side of the board as your components are on and push the wire though the board as close to the component that you are wiring up (you may even be able to push the wire though the same hole the component is going through). Solder up all the components and the wires and your circuit is done! Time for some testing. Tape both piezos onto a single piece of cardboard, this will allow the vibrations on the cardboard to move both piezos. Hook up the circuit to the module. Set the module trigger type to something that is a piezo/switch - personally I use a pd type pad (pd-7/8/9, etc). Hit the head piezo. You should get a response. Now hit the switch piezo. Did the rim light on the module light up? If it did, then you are good to go! If it didn't then adjust the trimpot all the way to one side and try again, then move the trimpot all the way to the otherside and try again. Still no rim light lighting up? Hit the switch piezo very hard ( ), but without damaging it - we have to make sure that the vibrations are closing the switch and reaching the head piezo. If it still doesn't work then you have to make sure that there is nothing in the circuit that is shorting it out, like some solder that is accidentally creating a loop somewhere it shouldn't. Then make sure that you wired all the components up right. If it still don't work, then cry, watch some tv and come back to it later. If it still doesn't work then post here and we'll try to help you out. Hope that helps some of you out there. Sorry there are no pictures, I didn't have any transistors left over so I couldn't build the circuit to show you guys how to do it step by step. Last edited by sae; 02-01-08, 05:42 PM. 3rding the sticky, this is a really good tutorial--thanks! One question, on these diagrams there is only one wire coming out of the piezo--which one is it, and what do you do with the other wire? I also see that several of them have a "ground" designation; I have a very basic understanding of why that's needed, but what do you do with those wires, if anything? Thanks sae, this looks great. One question, on these diagrams there is only one wire coming out of the piezo--which one is it, and what do you do with the other wire? The ones designated as "GND" (ground) get hooked up to the GND of the jack. It's just less messy to not show those lines in the diagram. So the brass of the switch piezo, the wire coming off of bottom of the circuit where the diode and 1M resistor are, and the ceramic of the main peizo all get wired to the sleeve ("GND") of the jack. If anyone is really interested (and feels a bit intimidated by these circuits), I will try to assemble a step-by-step assembly pictorial and parts cross-reference, as my copious free time permits. That's right Myke - D3 in diagram #1 can be bypassed. Keith explained it to me by saying that depending on the module you are using (yamaha vs. roland, etc) that you may get better results either using or not using the diode. So he added the switch so that you could bypass it if that worked better for you. Remember that in this case a switch can be as simple as a wire that bypasses the diode. Oh, that explains it.....I understand the jumper/switch function, but have never used a Yamaha module, so didn't realize he was addressing two separate issues. Has anybody had experiences using these circuits with the Roland TD-6V module? I have one and I haven´t been able to make it work. Maybe I did the connections wrong or some component was broken or hadn't got the correct value. Is it valid for TD-6V? Which circuit did you make (#1 or #2)? How are you mounting the piezos (the vibration to the switch piezo has to reach the head piezo)? Did you remember to set your input type as a switch/piezo pad (i.e. cy-8, pd-7, etc)? What value do your have for R1? What input are you using on your td-6? 1 - Building the circuit for connecting two mono pads (the one in the PDF document). The R1 value I used was like in the PDF (10k + 100k pot). I have checked your diagram with photos of the components and I set the circuit like that. 2 - Connecting two PD-8 pads to the Tom1 input on my TD-6V. 3 - Configuring trigger type as PD-8, and also I tried CY-8. But what I got was a good sensitivity in head pad and no sound in the Rim pad. Well, thinking it better, I tried both circuits, and I think that kind of behavior was with the piezo/piezo to piezo/sswitch circuit. With the other circuit I got head sound in the head pad and also head sound in the Rim pad, both with a good sensitivity. Does that mean that the velocity signal is arriving to the head input correctly, but it is not switching the switch? I have never used the circuit to actually use two pads into one input...so hopefully I can steer you in the right direction. With the other circuit I got head sound in the head pad and also head sound in the Rim pad, both with a good sensitivity. Does that mean that the velocity signal is arriving to the head input correctly, but it is not switching the switch? I assume that here you are refering to circuit #2? Circuit #2 has no way of transfering any switch piezo information to the tip of the jack, it works ONLY as a switch (ring of jack) and nothing else. All velocity information comes from the head piezo (tip of jack). So some signal is getting crossed somewhere from the rim pad to the tip of the jack on the output of the circuit. Are you using mono jacks for the "inputs" into the circuit? It doesn't really matter, but you want to make sure that you are only sending Tip and Sleeve information from the pads to the circuit. I can't remember if I've asked this before, but will a 1N914 diode work in place of the 1n4148? Also, is the BC337 a standard NPN?